Ahhh, P.F. Chang's: the popular faux upscale, dimly lit, and seemingly exotic Chinese restaurant where the food is surprisingly as good as its stylish decor and ambiance. I like this place not only for its interior decorating, full bar, and date-night vibe, but for its appeal to the uncommon diner: read, vegetarians and those with gluten allergies. While the relatively new gluten-free menu doesn't offer a ton of veg selections, the "regular" veg menu is quite varied, offering a multitude of appetizers, side dishes, and entrees. In fact, their veg-friendly menu goes so far as to specify that the sauces used are vegetarian, eliminating any worries we veggies typically have when dining Asian: the use of ingredients like oyster sauce and chicken stock are always questionable. As long as you can overlook those creepy terracotta soldiers in the decor, along with the fact that some of these dishes ring true the Chinese food stereotypes of grease and high sodium, this is a satisfying and surprisingly low-priced (well, for the veg items) dining experience. Dumplings, $5.95: I chose the vegetable-filled, pan-fried version (they are also available steamed). This gave the dumplings a slight crunch and great color, yet it contributed to their excessive greasiness. But once you can get past that, they are chewy, substantial, and a great starter course. The filling consists of mushrooms, tofu, rice noodles, and fresh ginger. I thought maybe I could make out some orange zest, which isn't uncommon for dumplings, but it was so faint that I couldn't be sure. 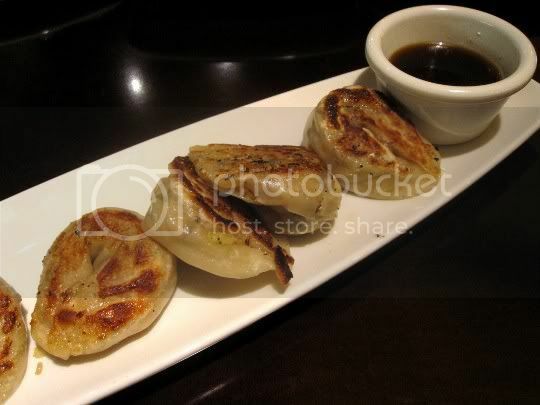 A sweet and tangy soy-based sauce is served alongside the dumplings, which is a perfect complement. Wok Seared Mushrooms (small), $2.95: This dish was both a hit and a flop. 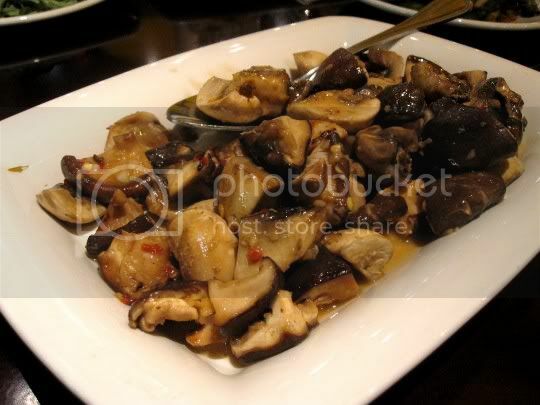 The assorted chopped mushrooms (button, shiitake, and portobello) are VERY garlicky, salty, tangy (from lime juice, I think), and have just a bit of heat. Fresh ginger made them fragrant and spicy, a great pairing for earthy and solid mushroom flavor. However, I had two issues with this dish: first, I think the mushrooms would have been a lot better had they been cooked longer. They weren't anywhere near raw or anything, but I like my mushrooms to be cooked to the point of "well done"-ness, until they get that sort of outer edge chewiness and texture. The button mushrooms, for example, still had that bit of sliminess that mushrooms can get when not cooked long enough...although the shiitakes and portobellos were by far the best in the dish. My second problem was that once this dish started to cool down, that slimy weird thing that happens to mushrooms increased. You'd definitely have to eat this dish right away while it's still hot. Otherwise, meh. Sichuan-style Asparagus (small), $2.95: Mmmmm, asparagus is one of my favorite vegetables, and what better thing that to make it sweet, spicy, salty...yum! 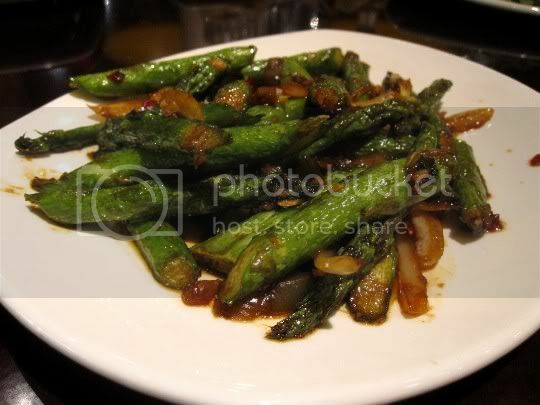 Stalks are cut into about 3-inch pieces (tips included, of course), steamed until just tender, and stir-fried with onions, green onions, and red pepper flakes. The dish is heavy on the soy sauce, but interestingly enough, it didn't have as much heat as the name "Sichuan" would imply. I did catch a few woody-stemmed pieces, but not enough for me to complain. One mystery of this dish was the other diced vegetable that was incorporated: it was VERY salty, firm, and juicy. It was high enough in salt content and had a flavor that makes me think it was some sort of sea vegetable. Green Tea Soba Noodles (small), $2.95: This was the least salty of the dishes, but one of the greasiest. These slightly chilled, slightly sweet noodles are literally green in color, although I'm not sure I tasted a strong green tea flavor. 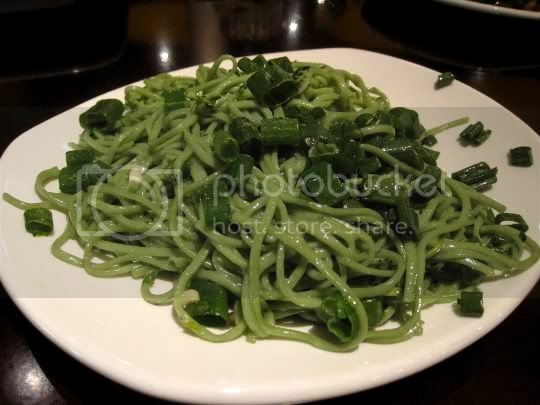 For some reason, there were a few non-green noodles strewn throughout, making me wonder how and what actually turns the noodles green. Green tea certainly isn't THIS green, so I'm thinking maybe they used matcha (green tea powder) for the color...or maybe they added a couple drops of food coloring, who knows. I've found matcha to have a very distinct and strong green tea flavor, so I'm leaning toward the latter theory. Tossed with green onions, fresh mint, and fresh cilantro, this is a good side dish and a nice mildly flavored pairing with more salty and tangy elements. Eat here again? Definitely. It's one of my go-to places for Asian cuisine, and the fact that their menu is vegetarian-friendly is an even better thing.